Another early morning here. The day ahead looks fraught, frenzied, and frazzling, so talking to all of you first, takes the rest of the day off my mind. How is everyone? Do you even have to ask, you say. It’s December 6th. I know. Although, having said that, I have worked on more poetry in the last six days than all of November. So, maybe frazzled is good. I keep coming up with prompts over which I am excited because I know many of you will enjoy them, and then telling myself there is no use using them before January. Sigh. I’ll be glad when we are back to normal, or as normal as our lives get. I am going to give you three Hopper paintings. You enjoyed the first so much. Even if all you have time for is to stare at the paintings for a few minutes, how nice is that? Either, choose your favourite, or look for a commonality you wish to write about. Ignore the captions. For the moment these paintings are yours. Or, use the captions to spark something. 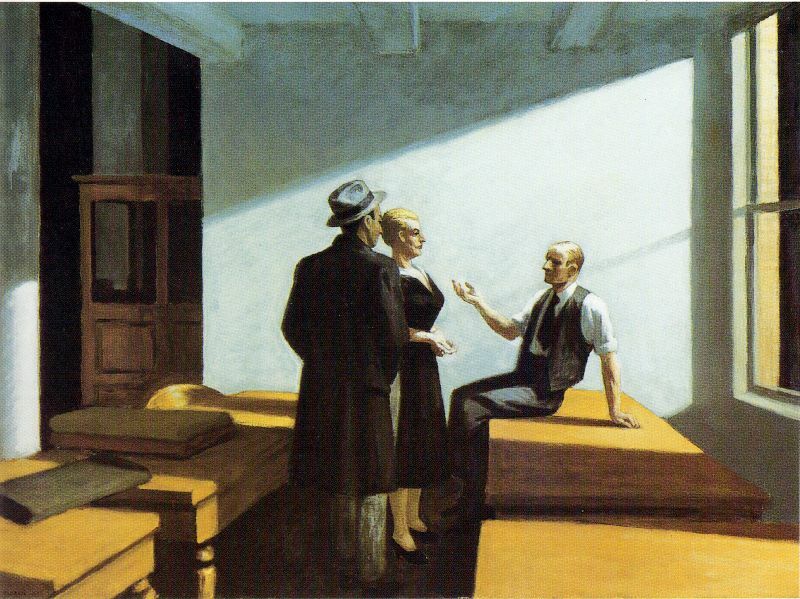 By now, most of you know how the guidelines for this type of prompt go, so I am giving you a link to the post with the first Hopper painting we worked with. If you responded generally last time, you may wish to follow one of the more guided suggestions. If you followed one of the more structured suggestions last time, you may wish to respond to a scene, without strictures. Remember to stop and breathe in the next few weeks. If you are feeling particularly harried, stop whatever you are doing and put yourself outside whatever is happening for a few moments. Doing this not only regenerates energy, but also generates scenes for writing about. You become a Hopper looking at a scene that you wish to paint with words. Before you dive back into the frenzy, jot some notes, or take a photograph to remind you later…in January. I shall see you Friday for the week’s roundup of prompts; and next Tuesday for the last of the Tuesday Tryouts before I go dark for the season [about two weeks]. Even if you don’t get a poem posted, remember that you can write and post at anytime. 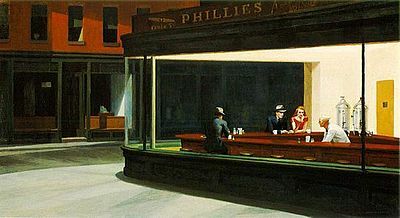 Nighthawks is one of my favorites, every time I visit the Art Institute I spend several minutes in front of it. The colours alone keep me in front of Hopper works. I’m jealous. 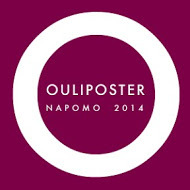 I would love to be able to wander into a gallery… I must check. Now that we are settled here, I need to find a gallery, or two. And I say thank God for the Internet, that never closed gallery – where we can find anything we want on tap, poems, pictures, music. My poem is here, and I too chose Nighthawks. Hey, lady! Looks like Nighthawks is the popular favourite! 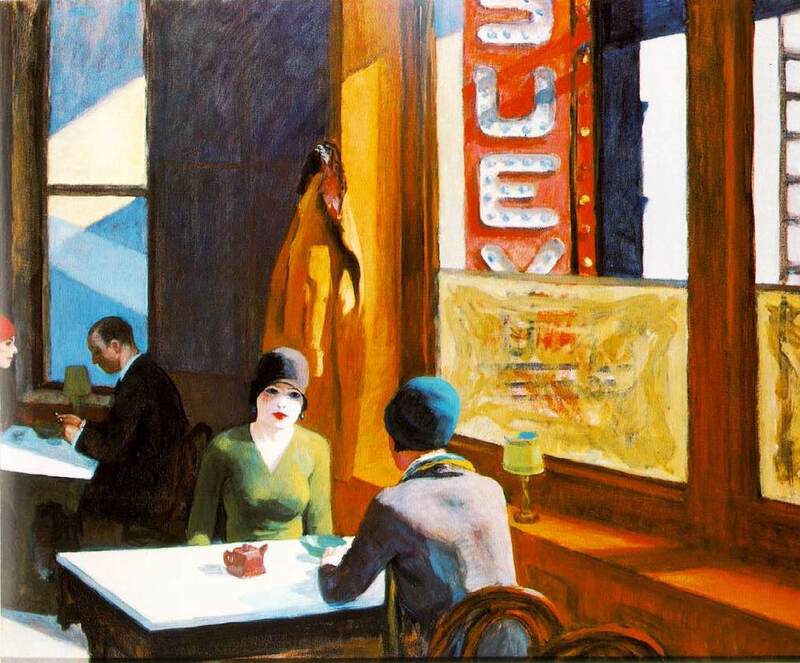 Hi Margo, I simply love “Chop-suey” by Hopper. I going to write something in the next day or two. I actually finished a poem today for We Write Poems this week, which in itself is a miracle. 🙂 I see you have snow on your blog as well. I do too, I love to live precariously through the people up north. I love the snow! I hate when they turn it off. I am glad you are taking on ‘Chop-suey’ Pam. It’s such fun. I’ll look forward to your poem. You noticed? At this time of year? I’m impressed 😉 I’m not sure my English teacher radar would pick it up this month. Nice series, Margo. I did the chop suey one. I learned about your blog from Marie Elena’s ‘Poetic Bloomings’, read your interview, very interesting! She looks so thin, and tired. She wouldn’t meet my eyes. I change my mind again. And yet she won’t turn back. Welcome, Alexandra, and how lovely to start with a poem. I like the thought of the pair being sisters and the intensity of their body language makes your conversation poem work. Thank you for the warm welcome and encouragement! You have made a compelling story about this painting. Margo’s had agreat idea to give us such wonderful material to spark our poetry. I really like yours, and hope we see you here again. Love the Hoppers, Margo. I didn’t do them justice, but enjoyed the writing, nonetheless. I admit, Barb, I am curious to see what you consider not doing them justice, as I don’t think I have read anything of yours that isn’t somewhere on the scale of good to great. Pamela, thank you for your support. I love your visits. Remember, Mary? No such thing as late. Only that fewer readers might be lucky and read your poetry. Ok I’m late, and not, since I so wanted to write to the Nighthawks painting too.